Happy Kitchen Sink Stamps Monday, thanks for much for stopping by today, I hope you had a great weekend! 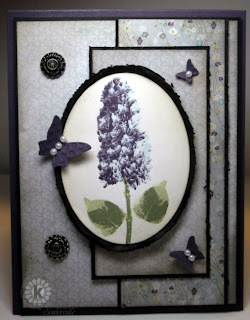 For today's card, I started out with Jen's SFYTT, and paired up the Multi Step Lilacs with Basic Grey's Wisteria Collection. When I went to photograph the image, there was a little too much space on the left hand side, so I took some creative liberties and added some Eggplant Butterflies. The Lilac and stem are stamped on White, then cut with Spellbinders Oval Die, layered on a Black Oval, which I added the Torn Frames technique too. The White panel and BG Wisteria papers are all sponged with Pumice Stone Distress Ink. You have the most wonderful papers! I love the purple hues and the balance you added with your butterflies. Simply beautiful! Beautiful work with this exquisite lilac, Lisa!! I love these delicate blues! 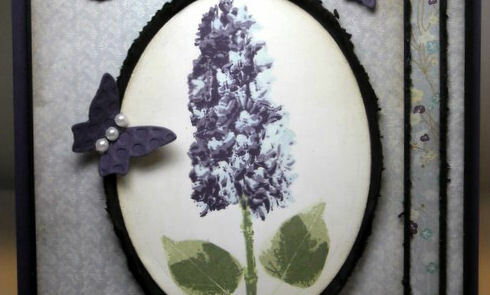 The tiny eggplant butterflies are the perfect accent for your stunning design!!! Very pretty card to wake up to this morning. Love it! Oh so beautiful, Lisa!! i just love this sketch, and the butterflies you added are so perfect!! Just beautiful!!! The butterflies complete the card perfectly! Great idea! Lisa, what a beautiful monochromatic card!! Your lilac images are always so gorgeous! Wonderful butterfly additions too! Lisa your lilacs are just delightful! I love how you added the little butterflies. Beautiful card! What a pretty card, Lisa! Your butterflies are the perfect finishing touch! Beautiful card, I love the color pairing of the card and the little butterflies are so cute. This card is so elegant. It is really beautiful. A truly lovely card Lisa.